Did you know? The majority of people that want web hosting for their website do not need Windows-based web hosting. Windows hosting is usually more expensive and serves a specific purpose. If you aren’t needing a specific Windows-based technology for your website, then head over to the best web hosting page. Who needs Windows hosting? If you are installing a website that requires .NET, ASP, Cold Fusion, Microsoft Access or MS SQL database technology, then yes, you are on the right page and you’ll need Windows-based web hosting. The biggest confusion we see is people that want to start their first website and assume the fact they use the Windows operating system locally, that they will also need Windows web hosting. Wrong. If that is you, go with Linux shared web hosting because it’ll be considerably cheaper and it’s what most websites use. Arvixe Awarded Best Windows Hosting Service! Instant 20% Discount on Arvixe Windows via T5A! Unlimited disk space and bandwidth transfer on all plans. Use coupon TFA20 to save 20% off any Windows plan. Includes free domain. Host 6 websites on their smallest plan or upgrade to Pro for unlimited. Supports ASP.NET v2, 3.5, 4.5, ASP .NET MVC, MS SQL 2012, LINQ and Access. ColdFusion is an additional $5/mo per domain. MS SQL Reporting Service is $5/mo. Arvixe already had the most competitive Windows hosting prices in the industry, then they took it a step forward by offering our visitors a 20% instant discount. Click the red button below to claim the offer and have the coupon auto-inserted on your order to ensure your savings. ASP.NET v2, v3.5 and v4.5. The latest ASP .NET MVC framework. Besides these included technologies, you can add ColdFusion support for $5/mo per domain you need support on and you can ad MSSQL reporting service to your entire plan for $54/mo as well. Regarding the actual plans, we’ve reported the real cost in our pricing above which is what you should expect to pay during checkout. All Windows hosting plans include a free domain name for the life of your web hosting plan. PersonalClass ASP: Includes access to unlimited disk space and bandwidth and it allows you to host 6 websites on the same plan before needing to upgrade. $96 for 2 years, $57.60 for 1 year, $33.60 for 6 months, or $6.40 paid monthly after your 20% off discount through Top Five Advisor. PersonalClass ASP Pro: This will unlock hosting for unlimited domains if you need to host more than 6 websites. Your cost at checkout will be $153.60 for 2 years, $86.40 for 1 year, $48.00 for 6 months, or $8.80 monthly. Important: Only through our link here can you order anything besides the 2 year plan. After clicking the red button below, click “Order Now” where you can select your plan duration. If you go to the website directly, there’s currently no option besides 2 years. Use coupon Business695 for $6.95/mo hosting. Instant $30 off + 20% off coupon code only works for the 1 year plan. Hosted on Windows Server 2008. Microsoft Silverlight support for rich interactive application delivery. Microsoft Exchange email service with SpamExperts service included. MyHosting Windows hosting services are a bit more expensive than what we’ve seen but thankfully with the coupon you are being offered here from Top Five Advisor, it makes it much more manageable at $6.95/mo over their standard $9.95/mo+ rate. Unfortunately, the Business695 coupon code will only work on the 1 year plan, so if you want to pay monthly, your rate will be considerably higher. In fact, if you select the 6 month plan during checkout, the price is actually more than the 1 year plan with our coupon code applied. Microsoft Silverlight for AJAX, VB, C#, Python and Ruby code. One really nice thing about MyHosting is that they offer an upgrade pathway to a Windows VPS. Most Windows hosts only offer shared Windows hosting and dedicated servers, but with MyHosting, you can upgrade to a Windows VPS plan later on for $34.95/mo when you site needs it. Save 20% off HostGator Windows hosting via T5A. Unlimited space and bandwidth on all Windows hosting plans. Personal plan allows 1 domain to be hosted per plan. Enterprise plan allows 5 domains (see pricing below). Hosted on Windows 2008 servers with Plesk control panel. Supports ASP.NET 2.0, 3.5, 4.0 and 4.5. Unlimited MSSQL and MySQL databases allowed. HostGator continues to be a massive brand and is still very popular for those needing Windows hosting. Although they are now a brand owned by Endurance International Group, they continue to have a good reputation from those using their Windows hosting. ASP.NET 2.0, 3.5, 4.0 and 4.5. Classic ASP also supported. MSSQL. HostGator allows unlimited MSSQL databases. Windows Personal: Allows 1 domain. Private SSL available. $2/mo for dedicated IP. These prices include a 20% instant discount from using our red button below: 3 years $171.36, 2 years $133.44, 1 year $76.32, 6 months $47.76, or $7.96 for the first month. Windows Enterprise: Allows 5 domains. Includes free private SSL and a free dedicated IP address for one website. These prices include a 20% discount automatically applied with our button: 3 years $516.96, 2 years $363.84, 1 year $191.52, 6 months $95.76, or $15.96 for the first month. Exclusive $5/mo 50% off discount offer via T5A! ​Windows hosting is their specialty. They have all Windows technologies. 1GB web space with 80GB data transfer in an isolated app pool. Choose between Windows 2012 or Windows 2008 servers. Choose between USA or Europe datacenter. 50% off discount includes free setup $25 savings. Shared Linux hosting customers have many hosts to choose from that focus specifically on Linux, why shouldn’t you have a host that focuses specifically on Windows web hosting? DiscountASP is that company. One of the biggest benefits of this is you will get technical support representatives that deal with and understand Windows hosting and won’t confuse your questions with that of a standard Linux hosting question. ASP.NET 2.0, 3.5, 4.52. Classic ASP 3.0. Full Trust ASP support on shared hosting due to isolated application pool. Microsoft Silverlight, LINQ, nose.js, WebSockets and AJAX hosting. Flash, shockwave and http audio/video streaming. Unlike other hosts, DiscountASP includes MS SQL databases hosted on separate server environments. The problem is they charge add-on fees for MS SQL database access. Considering all the databases they offer in various configurations and various reporting services, we’ve included a screenshot so that you can see what the fees are. See below. The add-on summary here is you can expect to pay $10/mo for a MS SQL database with 1GB of space and 1GB transaction log. Claim your DiscountASP instant 50% off discount using the red button below. Unlimited disk space and unmetered bandwidth. US-based 24x7 customer support with no outsourcing. ASP Classic and ASP.NET 3.5 Supported. We’ve already reviewed other Windows web hosting services which are included below for your reference. 1and1 Windows Hosting Review – On the 1and1 web hosting page, look for “Choose Your Operating System” and select Windows to see the 3 Windows hosting packages they offer. Their cheapest plan is just $0.99/mo for 12 months for a total of $11.88 due at checkout. You can also order a free domain through their service or transfer an existing domain. Supports all .NET frameworks through 4.5 including ASP.NET classic. MS SQL 2012 and MySQL 5 are available with 1GB space. Lunarpages Windows Hosting Review – For 12 months of service with Lunarpages, your total cost will be $131.40 excluding upsells they offer. Any Windows plan ordered less than 1 year prepay requires a $30 setup fee. 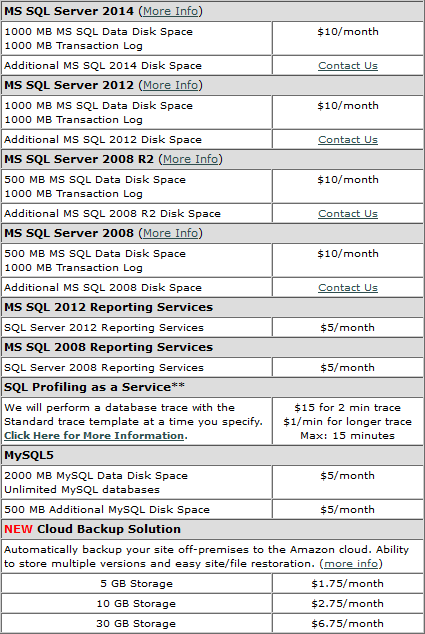 1 MS SQL database is $10/mo more. All plans include unlimited disk space and bandwidth.